Entry Criteria: Learners shall hold a Deck or Engineering Certificate of Competency at the operational level and meet the minimum seagoing service requirements for the issue of a management level CoC. Candidates should have NOE or proof of eligibility for any Management level COC such as discharge book entries or sea service record letter from company or any management level COC or correspondence from MCA conforming that you have applied for an NOE. A comprehensive review of the STCW Convention 1978, as amended, culminated in a Conference of Parties to the STCW Convention, held in Manila, in June 2010. This Conference adopted a significant number of amendments to the STCW Convention and STCW Code. Amongst the amendments was the requirement to introduce mandatory training in resource management, leadership and team working skills at Operational level, and leadership and managerial skills at Management levels. 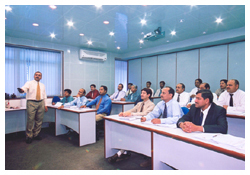 This course has been formulated on the basis of MNTB guidelines produced to comply to the above mentioned requirement. This course meets the obligatory requirements concerning Bridge Resource Management, Engine Room Resource Management and various principles of leadership and team working skills onboard ships.